Q: What is the best way to deal with puppy teething problems? If there’s something you don’t want your puppy chewing on, put it away somewhere in a closet if possible. If it’s furniture that your puppy loves chewing on, try to keep your puppy away from this via using a crate when you go places and at night, keeping an eye on your puppy, and using baby gates and shut doors to keep your puppy out of these areas and away from the problem spots. Bitter Apple Spray works good for keeping dogs from chewing on things. Bitter apple spray is non-toxic and when the dog licks or chews something with the spray on it, the sour taste deters the dog from continuing. Simply spray the bitter apple spray on things your dog chews on that you’d rather it didn’t. Apply it as often as necessary. 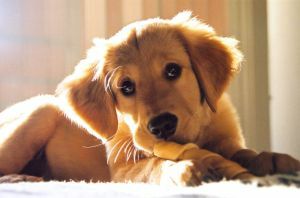 (supervise them while playing with any toy, especially rawhides), and teething toys . If your dog is bored, he may chew up things as a way to get some excitement. Exercising your dog the appropriate amount for the breed he/she is will be the best thing if your dog’s chewing is related to boredom. Like most things, your dog’s chewing phase will pass. I know it might seem like your dog is going to continue destroying your favorite things, but sooner or later, he’ll grow out of the habit.